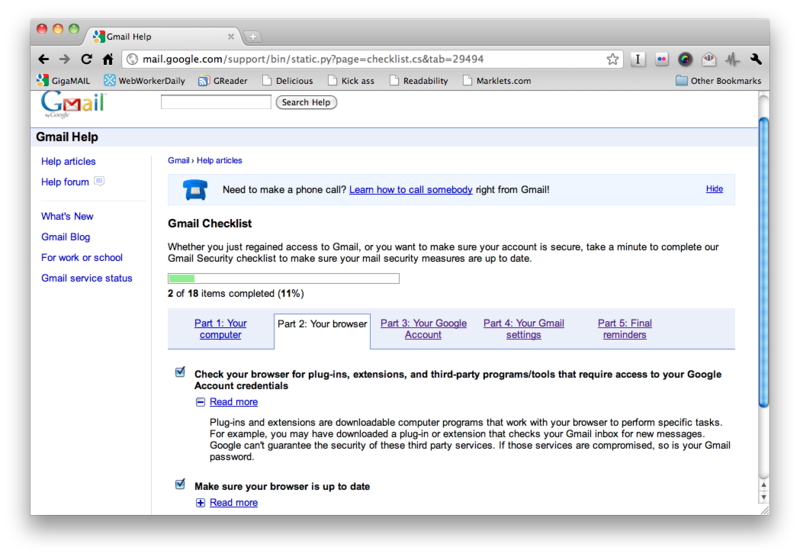 Want to make sure that your Gmail account is secure? Google (s goog) has provided a handy online checklist that takes you through the steps needed to protect your account against hackers. The list organized into five sections: Your computer, your browser, your Google account, your Gmail settings and “final reminders” (covering things like not sharing your Gmail password with other websites). Most items on the list have a “read more” link for further explanation. Most of this is fairly basic stuff, like keeping your OS and browser up-to-date; I would have thought that the items on the list will be checked off without a hitch by people as tech-savvy and diligent about security as our readers. However, it’s definitely worth working your way through just to make sure that you’ve got all the bases covered; it only takes a few minutes. Where this checklist really comes in handy, though, is for sending to those of your friends, family and colleagues who are seemingly constantly falling prey to dodgy emails and getting their accounts hijacked. Note: When I tried using it, the site seemed to have trouble saving my checkmarks (I’m not sure why it even needs to save them), which meant that when I moved between the sections in the checklist, the count of the number of items I had completed went back to zero. The checklist itself is still perfectly usable, but it might be worth bearing this in mind if you do send it to someone who’s not too tech-savvy.